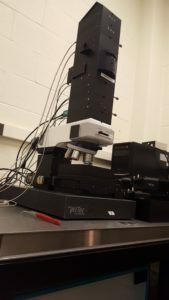 The WITec Raman is an advanced confocal Raman microscope that combines fast imaging, high spectral sensitivity and spatial resolution with excellent analysis software into a system designed around spectral imaging. The system has 2 lasers – 532 nm and 785 nm – and 2 spectrometers covering shifts in the visible and near infrared range. Raman shifts within ~100 cm-1 of the excitation frequency can be measured. 63x oil immersion; 1.4 N.A.